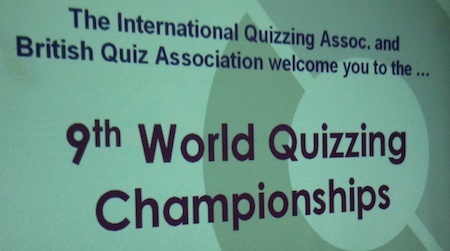 The 2011 World Quizzing Championships took place on Saturday last, June 4. The event was held in 79 venues, spread across 32 countries. Alas, there wasn’t a heat in Ireland – the nearest was in the UK. As luck would have it, myself and my long-term quiz buddy Mike were in England at the weekend for the wedding of our old friend Patrick to his fiancé Ruth. Sure, it took almost two hours to drive from Leeds, where the wedding was on, to Lichfield, where the quiz took place. But, again luckily, the wedding wasn’t until 4pm so we managed to fit everything into a very packed day. We set off at 9am and arrived in Lichfield just before 11. The quiz itself takes the form of an exam. Paper 1 started at 11:30am and took one hour. As we were running to a tighter schedule than everybody else, we were allowed to start Paper 2 pretty promptly and ended up finishing up around 1:50 pm. So, what was it like? Well, you’re talking quizzing royalty here. For instance, I bumped into Kevin Ashman as I walked down the corridor in the direction of the toilets! I was hoping to have a word with Pat Gibson, probably Ireland’s greatest ever quizzer and the reigning champion, but unfortunately our paths didn’t cross. In fact, due to our hurried circumstances, we didn’t really get a chance to talk to anyone, except those who were beside and opposite us at our exam table. These were Roderick Cromar, a Scottish gent in his 50s, and Jesse Honey, an English guy (with an unforgettable name!) who was around our age, that is to say early 30s. These guys were very welcoming and friendly. They were also a little surprised that this was our first event on the quizzing ‘circuit’. That we had decided to dive right in at the deep end was the summation of their reaction. The Cathedral Lodge Hotel (and Lichfield itself) seemed, on the face of it, to be a strange choice of venue. A relatively small, old-fashioned hotel where we only fitted in by the opening of a partition wall, thus creating a room which had the shape of a captial T. Chris, one of the organisers on the day, answered this unasked question before the quiz started though by telling us that the venue had been chosen in memory of Mark Bytheway, the 2008 champion, who passed away last year. He was a native of Lichfield. The quiz is really eight quizzes. Each of the two papers contains four sections. These are: culture, entertainment, history, lifestyle, media, sciences, world and sport & games. Each section has 30 questions so each paper contains 120 of the blighters. Fans of maths will have worked out that this means you have, on average, 30 seconds to do each question. At the end of the day, your lowest score is discounted so totals are thus out of a max of 210 points. As we had to rush away, it was the following morning before we found out how the quiz finished up. Pat Gibson had retained his title with a phenomenal score of 186/210. This was so good as to be 10 points ahead of his nearest challengers Tero Kalliolevo (Finland) and Kevin Ashman. Four points behind them, on his own in fourth, was Jesse Honey, late of our table. Both myself and Mike were delighted to see him finish this high up the leaderboard. If you feel like being thorough, you can check out the full final score list here. I will post up some questions from the WQC in my next blog post. * Pat Gibson represents England in the world of competitive quizzing. He won Mastermind in 2010?! I would have to suggest that you are the man to ensure that the next world quizzing championship does have an Irish heat. You could then pick the venue base on where your next friends are to wed.
Did you notice that the guy who won the media round only got one question wrong, the one you were telling us about over dinner. Must be nice! Happened upon this: http://cityroom.blogs.nytimes.com/2011/06/06/q-who-finished-112th-in-the-battle-of-the-brains/ Don’t think the Telegraph journo ever submitted a story though.